Hot Water System Repair Sydney & Central Coast. Same day service. Broken hot water system? No hot water? Burst hot water tank? Water heater not operating how it should? Call us for fast, same day hot water system repair to all Sydney suburbs and Central Coast. We are the hot water system repair experts and our trucks are on the road right now to repair your hot water heater today. Your hot water system is an expensive appliance and should always be repaired by a fully qualified hot water plumbing service technician. Sometimes water heater repairs require the services of both a plumber and an electrician. Our licensed hot water system repairers are qualified to undertake both the plumbing and electrical side of any problem. This saves you money as you don’t have to employ various trades to undertake the job. It also saves time as you don’t have to wait for multiple tradespeople to turn up – sometimes days in between. We can take care of all work required right there on the spot. 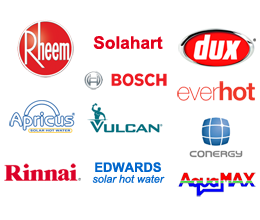 Our full stocked hot water system repair trucks are on the road now carrying spare parts for all makes and models including Rheem, Dux, Rinnai, Aquamax, Bosch, Conergy, Hocking, Apricus, Vulcan, Edwards Solar, Solahart, Everhot and more. We are authorised service and repair technicians for all the major brands. All our work is carried out by our experienced and licensed hot water installers – we DO NOT employ sub-contractors or outsource work to unskilled workers. Your hot water system is a very expensive appliance so why would you risk using an installer who is not qualified to install your hot water system.